That is awesome! Congrats, I’m sure it must have been a ton of work. It’s not loading. Browser says “waiting…”. Guess it’s being hammered :). Can’t wait to fire it up. 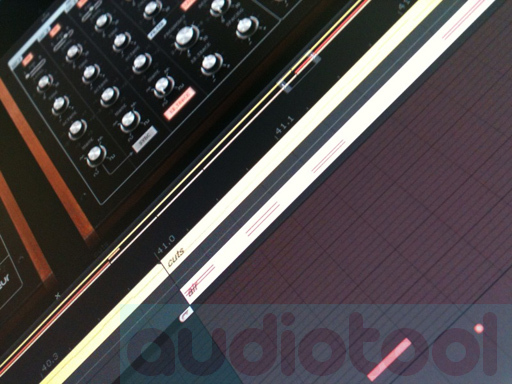 Hope to get my hands on the new Audiotool this afternoon! btw, is there any way to download tracks, or is it only possible to listen via audiotool.com? An embeddable audio player would make this a perfect package. In my book, this is by far the most powerful and amazing use of the flash platform. Both stunning and fantastic fun to play with for hours! That’s really amazing ! I’ve been following your work since your first sound experiments and I’m really glad you’ve come up with such a project ! Many many thanks to all the Audiotool team to bring real audio synthesis and production to flash and long life to the Audiotool ! This is a really great tool — I’ve been wishing for a sequencer from the start. It’s already given me my first sleepless night and four days of missed piano practice. If you care to say, I’d love to know what more is in the pipeline. I’m starting to want to think of ways of incorporating your tool into my analog setup, or vice versa. The Audiotool is an amazing example of what is possible with Flash! I have been following your work for a while now, and have studied the hell out of your Popforge/909 code while working on an audio mixer of my own. I know that the source code for the Audiotool is secret, but is it possible to get any information/advice at all as to how the audio is being processed (i.e. PixelBender shaders, best practices, performance tweeks, etc…)? btw – Have you and Joa thought about authoring a book on audio programming in Flash? Something like that is long overdue – and I`m not quite at the level of writing one…yet!